Defense Minister tours Gaza envelope, warns Gaza residents to focus on getting rid of Hamas rather than destroying Israel. 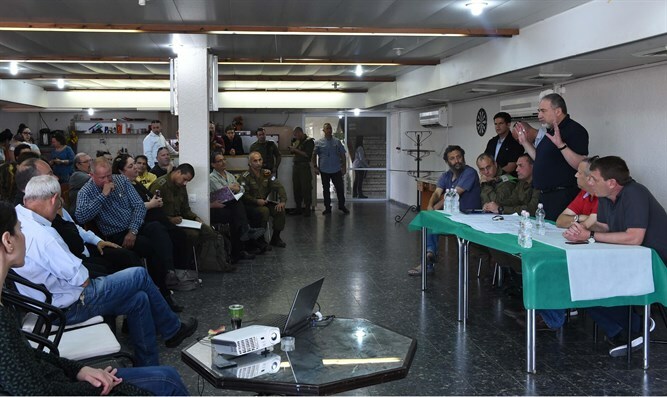 Defense Minister Avigdor Liberman toured the Gaza envelope Tuesday and was briefed on the deployment of IDF forces in the area. "Anyone who comes close to the fence endangers his life and I suggest that the people of Gaza invest their efforts not in protests against Israel, but in changing the leadership within the Strip. The same leadership that instead of focusing on the development of electricity, water and education infrastructure is investing $260 million in terrorist infrastructure, tunneling and manufacturing rockets," Liberman said. The defense minister noted that most of the Arabs killed by IDF fire during the riots last Friday were Hamas terrorists. "Most of those killed are terrorists whom we know well, activists in the military wing of Hamas, and also from Islamic Jihad, not innocent civilians who came as part of a civil protest." "It was a well-organized provocation by the military wing of Hamas in an attempt to harm our sovereignty, violate our daily routine, disturb the Jewish people on the Seder night which we celebrate with confidence and optimism, and we did what is incumbent upon us ... We are not initiating any provocation against the residents of Gaza. We protect our residents, that's all the difference," he said. Liberman was asked whether he intends to extend Chief of Staff Eizenkot's term and allow him to serve for a fifth year, and the defense minister replied: "There term of chief of staff is defined by law, and that is what will be. There is no need [to extend Eizenkot's term]. I think we have an excellent chief of staff, he does an excellent job and it's important to preserve the frameworks, the law, and the same terms that they allocated in the government and the Knesset."